The page for Tilted Kilt menu prices. 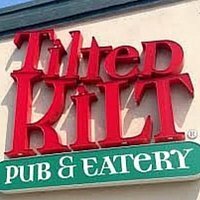 Tilted Kilt Pub & Eatery is an American, Celtic-themed restaurant and sports bar serving traditional and modern pub-style food such as Drunken Clams, Olde Dublin Irish Stew, classic fish and chips and TK Irish nachos with their signature Guinness Beer cheese sauce. Besides the regular choices on the menu, Tilted Kilt also offers seasonal specials throughout the year. The interior design is best described as a combination of American, Irish & Scottish sports pubs. The famous ‘Tilted Kilt girls’ where mini kilt skirts and plaid bras. Below are the latest Tilted Kilt menu prices. Can’t get seats to the big game? Tilted Kilt is the perfect place to watch live professional and collegiate events. Dozens of flat screen TVs located throughout the restaurant make it easy to watch football, basketball, or fly-fishing. For guests not interested in watching live sporting events, certain locations offer billiards, darts, and shuffleboard to pass the time. Stressful days at the office call for a visit to the Tilted Kilt to enjoy their Hoppy Hour. Hoppy Hour offers guests reasonably priced small plates and cold, refreshing drinks. Hoppy Hour takes place between 3:00 PM to 7:00 PM every day. .For those guests that are looking for a late night snack, Tilted Kilt is the perfect destination. Tapas-style small plates are available from 9:00 pm to close. Be part of the Clan! Signing up is simple & free. The benefits are long-lasting. Just for becoming a Clan member, guests will receive an order of Pre-Game Pickles. Birthday celebration just got better with a free burger. Guests will not want to miss this anniversary, a free order of boneless wings. Just make your way to the official Tilted Kilt website to sign-up. Every year, Tilted Kilt offers guests the opportunity to purchase a Tilted Kilt bikini calendar that features 12 Tilted Kilt models from the U.S. & Canada. If guests like the current year calendar, they can purchase previous year calendars. So they can be consistent, right? Guests can also purchase Tilted Kilt apparel, caps, and drinkware. Guests can visit the Gear page on the official Tilted Kilt website. Ladies! Want to be part of an exclusive group of women that enjoy earning great money working a flexible schedule? If you are confident, outgoing, and smart then apply immediately. Applicants can show up for an audition at an existing location or casting call for a new location. All successful Tilted Kilt locations rely on managers that can inspire and lead a team of female entertainers and support staff. Candidates with previous restaurant management can apply online via the official Tilted Kilt website. The first Tilted Kilt opened inside the Las Vegas Rio Hotel & Casino in 2003 by restauranteur Mark Di Martino and his business partners & co-founders, Shannon Reilly & John Reynaud. Today, there are over 100 Tilted Kilt locations in the U.S. and Canada. The corporate headquarters are located in Tempe, Arizona. For more information about Tilted Kilt, please visit their official website.